For the purposes of this article, any undesired effect of a laser intervention is considered a complication, regardless of its frequency. For example, purpura following short-pulsed, pulsed dye laser therapy of telangiectasia or erythema following carbon dioxide laser resurfacing is expected in 100% of patients treated; nevertheless, these problems are still noted as complications. 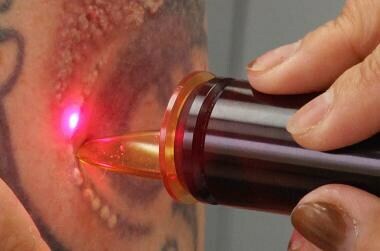 Laser tattoo removal performed by Alice S Pien MD, Medical Director of AMA Skincare. Courtesy of Wikimedia Commons (James Mutter, own work). Laser light (energy) has unique properties that allow it to be used therapeutically. Laser light is monochromatic (single wavelength), coherent (in phase, both in time and space), and collimated (light waves are parallel). These properties make possible the generation and delivery of high fluence (energy per area), which can interact with the skin to effect clinical outcomes that are both desired and undesired. Additionally, the monochromaticity of laser light is essential for selective targeting of structures in the skin (chromophores), which preferentially absorb light of that wavelength. Commonly targeted chromophores in the skin, which each have their own unique absorption spectrum for laser light, include water, hemoglobin, melanin, and tattoo ink. When laser light hits the skin, it may be reflected, transmitted, or absorbed. Absorbed energy is most responsible for the clinical effect because it is converted to thermal energy (heat) by the intended targets (chromophores). In many cases, complications result from collateral damage created when energy intended for the target chromophore is nonselectively diffused to and absorbed by surrounding tissues and structures. For example, hyperpigmentation and hypopigmentation noted after carbon dioxide laser resurfacing are related to damage to melanocytes vaporized along with targeted keratinocytes and fibroblasts in the epidermis and dermis. Similarly, in laser-assisted hair removal, unwanted damage to the epidermis (including melanocytes) may occur despite the fact that follicular melanin is the intended target. The first cutaneous lasers used continuous beams of laser light. Even when wavelengths relatively specific for a particular chromophore were used, their continuous output dictated that the tissue dwell time (ie, how long the laser was held to the skin) depended on the speed of the surgeon's hand—typically long enough to cause a buildup of thermal energy that diffused to nontargeted adjacent tissue. This led to undesirable rates of adverse effects and complications (notably, scarring) that limited the use of cutaneous lasers. For example, until the advent of pulsed dye lasers in the mid 1980s, continuous-beam argon lasers were used to treat port-wine stains. Despite high absorption by the target chromophore hemoglobin, nonspecific damage to surrounding tissue and scarring was relatively common. Most of the currently used lasers take advantage of Anderson and Parrish's theory of selective photothermolysis, thus minimizing the undesired collateral damage discussed above. This theory states that selective heating of a target chromophore is achieved when the laser wavelength is preferentially absorbed by the chromophore, the energy of the laser is high enough to damage the chromophore, and the pulse duration of laser energy is shorter than the thermal relaxation of the target (time it takes for the target to cool by 50% of its peak temperature after irradiation). The majority of cutaneous lasers in use today operate according to these principles and attempt to limit the duration of the laser light's impingement on tissue. In recent years, the majority of cutaneous lasers have been used with systems to cool the epidermis to prevent collateral damage to epidermal structures from laser light intended to target deeper structures. Some of the most recent advances in laser and light equipment technology uses within treatment fields small areas of therapeutic energy exposure interspersed with well-organized skip areas of normal, untreated skin. Often, these fields of treatment are administered via a specially designed handpiece, and the areas of normal untreated skin speed the healing process, while the small size of the treated surface results in an evident clinical effect but also serves to minimize the risk for adverse events and outcomes. All of the cutaneous laser systems in current use target structures in the epidermis or dermis. Most adverse effects and complications of laser treatment can be predicted by understanding that they are mainly due to collateral damage of normal adjacent skin structures. Newer devices in the past few years include nonablative laser systems, endovenous ablative systems, and fractional lasers (fractional photothermolysis). These lasers, unlike classic ablative resurfacing lasers (eg, carbon dioxide, erbium), typically have the same low-risk profile for complications as other nonablative pulsed laser systems, which do not target the epidermis. Intense pulsed light has increasingly been used in clinical practice for photorejuvenation, treatment of vascular and pigmented lesions, and hair removal. Because the intense pulsed light is not a true laser, but an energy composed of a combination of numerous wavelengths of light, specific complications are beyond the scope of this article. As with all light-based therapies, however, risks include hyperpigmentation, hypopigmentation, erythema, blistering, and scarring. Depending on the laser and its indication, laser-tissue interaction may produce a smoke plume and/or tissue splatter. While it is difficult to quantify the actual risk of transmission of infection, concerns exist. Human papillomavirus has been cultured from the plume generated with carbon dioxide laser treatment of warts. A smoke evacuator and special laser mask (filtered to 0.3 µm) should be used if laser plumes are anticipated. Additionally, the tissue splatter produced by some Q-switched lasers necessitates wearing of gloves, eye protection, and masks. Postoperative hypopigmentation is also possible, particularly after the use of lasers that target melanin as a chromophore, or pigment-specific laser irradiation. Thus, it is quite common in tattoos, pigmented lesions, or hair removal treated with Q-switched ruby, alexandrite, and Nd:YAG lasers. In these situations, hypopigmentation is more commonly observed after multiple treatments and is more common in patients with darker skin types. In 1998, Nanni and Alster reported that hypopigmentation occurs in about 10% of patients treated for hair removal with the long-pulsed ruby and alexandrite lasers. As with hyperpigmentation, this complication is often temporary, although permanent hypopigmentation has been noted. Delayed permanent hypopigmentation has been recognized as a complication particular to ablative laser resurfacing especially carbon dioxide laser skin resurfacing. This undesirable effect is also caused by laser-induced epidermal damage (see postoperative blistering above). Crusting is common with Q-switched lasers used for tattoo removal but can be observed after treatment with other lasers as well. Without appropriate postoperative care, crusting is inevitable after cutaneous laser resurfacing procedures. Milia often occur as a normal event in the postoperative course of patients who have undergone carbon dioxide or erbium laser skin resurfacing. Their development may be reduced by application of topical tretinoin or glycolic acid. When just a few lesions are present, milia are easily treated by manual extraction. This permanent complication is perhaps the most feared of laser complications and was relatively common with continuous-wave lasers. The risk of scarring with more recently developed pulsed and Q-switched lasers that use the principles of selective photothermolysis is far less, but scarring is still possible with almost any device. Whether atrophic or hypertrophic in type, scarring is always due to excess damage to the collagen comprising the dermis. This may arise from direct laser-induced thermal damage or from complications such as postoperative infection. In general, the risk of scarring is low with pigment-specific lasers, pulsed vascular lasers, nonablative laser systems, and pulsed hair-removal laser systems. Cutaneous laser resurfacing (both carbon dioxide and erbium) has the highest risk of scarring because of the intended destruction of dermal tissue as well as the increased risk of infection in the deepithelialized skin. Factors such as the number of passes delivered and the energy used may affect the risk of scarring, while technology that uses a cooling system works to minimize this risk. Owing to the unique attributes of the individual’s skin receiving treatment, this complication may occur even at the hands of the most experienced surgeon and may occur in only a portion of the treatment field. Although the overall risk of a keloid forming in an individual undergoing cutaneous laser surgery is low, the individual risk is highly dependent on the medical history of the patient. Those with a known risk of keloid formation are much more likely to form keloids as a result of cutaneous laser procedures. Regrettably, once formed, keloids are extremely difficult to remove and prevent from reforming. A comprehensive medical history about past keloid formation is the best approach to identify those individuals at higher risk for developing keloids following cutaneous laser surgery. Once identified, a thorough and detailed consent process should be undertaken with high-risk patients, educating them that even the most superficial and noninvasive laser treatment could stimulate keloid formation. Although rare, delayed wound healing has been identified as a complication particular to carbon dioxide or erbium laser skin resurfacing. Once cutaneous infection (bacterial, fungal, and viral) and other systemic conditions (eg, lupus erythematous, connective-tissue disease) have been excluded as potential causative factors of the poor wound-healing response, its idiopathic nature is best managed with conservative wound management. Unfortunately, tissue fibrosis and scarring are common sequelae of a delayed wound-healing response. Cutaneous wound infection is most common after laser skin resurfacing, although it is sometimes noted in any laser case in which the epidermis has been damaged. Superficial viral, bacterial, and fungal infections are possible. Herpes simplex virus may be reactivated in a patient during reepithelialization after cutaneous laser treatments, especially hair removal and resurfacing. Antiherpetic prophylaxis is thus recommended for all perioral or full-face laser resurfacing procedures. Bacterial infections are typically caused by staphylococcal or pseudomonal species and have been shown to appear more often in patients who have used occlusive wound dressings for a prolonged period after surgery. Similarly, candidal infections may occur. One case of parapharyngeal abscess formation after laser resurfacing has been reported. Q-switched laser treatment (eg, of lentigines) has led to persistent hyperpigmentation in treated areas in patients who have received gold therapy for other conditions. The hyperpigmentation is thought to be related to alteration of gold particles already present in the skin. Some degree of erythema lasting less than 24 hours is present in virtually all laser procedures. More prolonged erythema may occur as an unwanted adverse effect but is also transient in almost all patients treated with nonablative lasers. More prolonged erythema is noted in all patients after ablative laser skin resurfacing. Its duration (from days to several months) depends on the depth and degree of dermal wounding. Erbium lasers typically produce less postoperative erythema than carbon dioxide lasers. This may largely be a function of the more superficial treatment commonly performed with erbium lasers, although it may also be attributable to the lower degree of residual thermal necrosis produced in the dermis upon erbium laser irradiation. An unusual reticulate erythema has been reported with diode lasers in hair removal. It is important to rule out infection as a contributing factor in all situations involving prolonged erythema. Allergic contact dermatitis or irritant contact dermatitis can develop after any type of laser procedure, most commonly to a topical antibiotic. Because of the difficulty in distinguishing contact dermatitis from infection in patients who have had laser resurfacing, many practitioners avoid the use of topical antibiotics in such patients. Dudelzak J, Goldberg DJ. Laser safety. Curr Probl Dermatol. 2011. 42:35-9. [Medline]. Pierce JS, Lacey SE, Lippert JF, Lopez R, Franke JE, Colvard MD. An assessment of the occupational hazards related to medical lasers. J Occup Environ Med. 2011 Nov. 53(11):1302-9. [Medline]. Vedamurthy M. How I Manage Complications in Aesthetic Surgery. J Cutan Aesthet Surg. 2015 Apr-Jun. 8 (2):106-7. [Medline]. Fisher GH, Geronemus RG. Short-term side effects of fractional photothermolysis. Dermatol Surg. 2005 Sep. 31(9 Pt 2):1245-9; discussion 1249. [Medline]. Lee WW, Murdock J, Albini TA, O'brien TP, Levine ML. Ocular damage secondary to intense pulse light therapy to the face. Ophthal Plast Reconstr Surg. 2011 Jul-Aug. 27(4):263-5. [Medline]. Sheinbein DS, Loeb RG. Laser surgery and fire hazards in ear, nose, and throat surgeries. Anesthesiol Clin. 2010 Sep. 28(3):485-96. [Medline]. Sawchuk WS, Weber PJ, Lowy DR, Dzubow LM. Infectious papillomavirus in the vapor of warts treated with carbon dioxide laser or electrocoagulation: detection and protection. J Am Acad Dermatol. 1989 Jul. 21(1):41-9. [Medline]. Izumi M, Ikeda Y, Yamashita H, Asaoka Y, Fujishiro M, Shin M, et al. Safety and Effectiveness of Endovenous Laser Ablation Combined With Ligation for Severe Saphenous Varicose Veins in Japanese Patients. Int Heart J. 2016. 57 (1):87-90. [Medline]. Handley JM. Adverse events associated with nonablative cutaneous visible and infrared laser treatment. J Am Acad Dermatol. 2006 Sep. 55(3):482-9. [Medline]. Mansur AT, Demirci GT, Uzunismail MA, Yildiz S. A rare complication of follicular hair unit extraction: Kaposi's varicelliform eruption. Dermatol Pract Concept. 2016 Jan. 6 (1):15-7. [Medline]. Willey A, Anderson RR, Azpiazu JL, et al. Complications of laser dermatologic surgery. Lasers Surg Med. 2006 Jan. 38(1):1-15. [Medline]. Anderson RR, Geronemus R, Kilmer SL, Farinelli W, Fitzpatrick RE. Cosmetic tattoo ink darkening. A complication of Q-switched and pulsed-laser treatment. Arch Dermatol. 1993 Aug. 129(8):1010-4. [Medline]. Lapidoth M, Shafirstein G, Ben Amitai D, Hodak E, Waner M, David M. Reticulate erythema following diode laser-assisted hair removal: a new side effect of a common procedure. J Am Acad Dermatol. 2004 Nov. 51(5):774-7. [Medline]. Shin JY, Chang H. Rhabdomyolysis After Cosmetic Laser-Assisted Liposuction. Aesthetic Plast Surg. 2015 Aug. 39 (4):635-8. [Medline]. The authors and editors of Medscape Reference gratefully acknowledge the contributions of previous authors, Daniel Berg, MD, FRCP(C), and Christopher A. Nanni, MD, and previous Chief Editor, William D. James, MD, to the development and writing of this article.